Higher taxes on tobacco products has forced more Russians to quit smoking. Tobacco users in Russia decreased by more than 5 percent in 2013, and experts expect a new higher excise taxes to reduce further the sale of cigarettes. Every Russian smoker knows the cost of his or her favorite brand of cigarettes, so when the price changes even slightly, its affect is felt. This was actually what the regulatory authorities were betting on when they increased the excise tax rate. By their calculations, the average person’s desire to save money would outweigh the craving for smoking. Russia ranks fourth in world rankings for the biggest number of smokers with 2,786 smoked cigarettes per adult citizen, according to the World Health Organization. However, thanks to current governmental measures, including an increase in excise taxes, the number of smokers should be reduced by 5 percent every year, experts predict. Excise rates in Russia are growing annually, and by 2015, this “sin tax” will double once more. The tax rate is calculated by a complex formula – in 2015, it will look like this – $28.6 per 1,000 items plus 9 percent of the price. 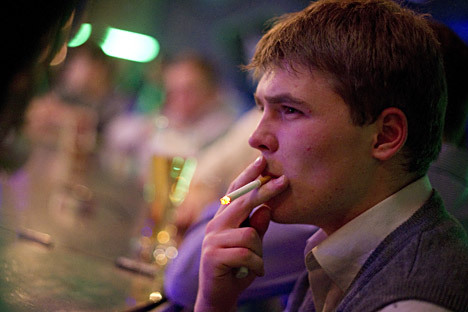 Another effective measure for decreasing Russian smokers is the law banning smoking in public places. It has been in force only since June 2013, yet has already affected the producers. During the first nine months of 2013, cigarette production declined by 5.4 percent, compared to the same period of the previous year. Experts predict that the tobacco market will continue to decline in 2014, by 9 percent to 11 percent. “Additional charges have always helped in combatting smoking and excessive drinking. After all, cigarettes and alcohol are not a necessity of life, and unlike food, a person can go without them,” said Esben Tranholm Nielsen, a business consultant for the Ministry of Agriculture and Food of Denmark. Only schools, hospitals and government offices are subject to the smoking ban law. For cafes and restaurants, it will enter into force only in 2014. However, many catering establishments have already started to follow this law. Alexey Savin, the manager of public relations for “Darling, I’ll Call You Back...” bars network, claims that restaurateurs sometimes take antismoking measures themselves, and much more efficient ones than those the state takes when it comes to prohibiting smoking in their establishments. “Often, this is done especially for the guests, because the smell of tobacco blocks people’s taste buds,” he said. Public health organizations are also optimistic for now. “Increasing the price of tobacco by 10 percent led to the fact that in Eastern Europe, the demand for it has fallen from 3 to 13 percent. For 11.5 percent of new smokers, the cost became a decisive argument against this bad habit,” said Renat Layshev, the president of the Russian Children: Educated and Healthy, nonprofit organization. However, tobacco companies tend to evaluate this data in a different way. Anatoly Vereshchagin, the communications director of Japan Tobacco International in Russia, said the law has been implemented only recently, so it cannot have had such an effect. As for the influence of excise taxes, customers, according to him, do not always quit smoking, and often they just turn to counterfeits or the smuggled cigarettes market. He claims that this is the reason that the share of smuggled goods in the Russian market has grown three-fold – up to 6 percent in the last year. Alexander Lyutiy, the corporate affairs director for British-American Tobacco Russia, agreed, adding that rising of prices, according to the observations of BAT, does not significantly affect the number of smokers, but it makes them think about a cheaper alternative. This leads to the appearance of underground productions flowing into Russia. So, even though statistics show a decrease in demand, in fact, according to Lyutiy, their number probably does not vary greatly – some of the smokers may have just switched to illegal products. According to the calculations of his company, because of that, this year the legal market volume, in physical terms, will, according to preliminary estimates, be about 7 percent to 8 percent lower than in the previous year.